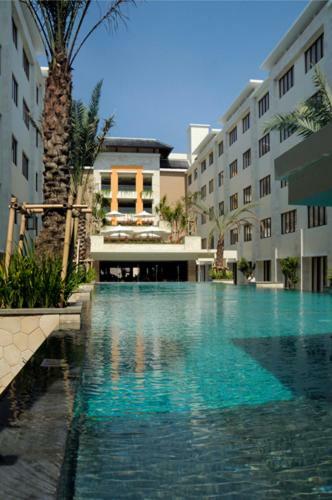 Aston Kuta Hotel & Residence - Kuta, Bali, Indonesia - Great discounted rates! 8.0 out of 10 based on 939 verified user reviews via Agoda. Ideally located in the prime touristic area of Kuta, Aston Kuta Hotel and Residence promises a relaxing and wonderful visit. The hotel offers a high standard of service and amenities to suit the individual needs of all travelers. 24-hour room service, free Wi-Fi in all rooms, 24-hour security, daily housekeeping, taxi service are just some of the facilities on offer. Each guestroom is elegantly furnished and equipped with handy amenities. Recuperate from a full day of sightseeing in the comfort of your room or take advantage of the hotel's recreational facilities, including fitness center, outdoor pool, spa, massage, kids club. Discover all Bali has to offer by making Aston Kuta Hotel and Residence your base. The property provides complimentary airport pick-up with maximum 4 person in a car. Please contact property directly for more details. Aston Kuta Hotel & Residence - Bali classifies itself as a 4 star hotel.